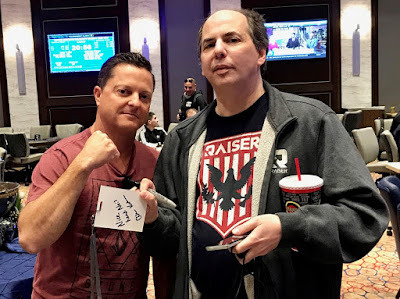 Pocket_Aces for Michael Cooper and Pocket_Sixes for Neil Rodvold ... all in preflop with Cooper's hand the best to start, plus his stack is bigger. The aces hold and Rodvold (above, after his elimination of Allen Kessler) is eliminated in 7th place, cashing for $2,354. Kelly Douglas eliminated Sue White in 8th place an orbit earlier ($2,095) by hitting a wheel.